I hope you all are having a wonderful weekend. The first Final Four game is about to start so I am going to try to type this as quickly as possible! I still have a few more projects I want to do for Easter but in case I don't get to them figured I would show you what we have done so far. The best part of this year's decorating is that the only thing I bought was some spray paint and the supplies for the moss letters (you can see a tutorial for those by clicking here). Everything else was free! I had planned on either having a robin's egg blue or a pink for an accent color but seeing how I went pretty overboard with the pink for Valentine's Day decided to just stick with neutrals for now. I still may add in some blue though. You can see what all of these topiaries looked like before in this post. I saw these eggs last year on The OC Cottage and thought they were really pretty. I made a bunch this year and a have them hanging from the branches in our living room and dining room. 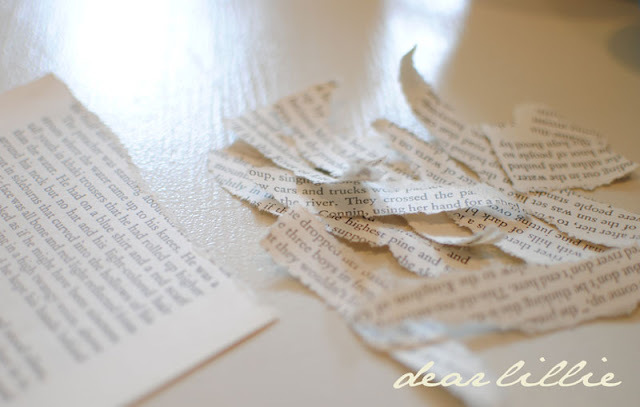 I plan on embellishing them when I get a chance but for now they are just covered in the book pages. I am not really sure how they are supposed to be made but this is how I did it. And the best part was I already had all of the supplies so they were free! 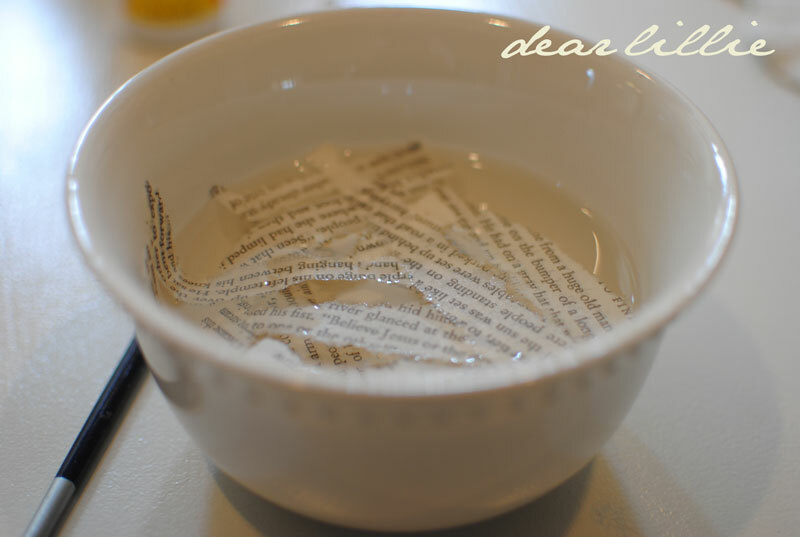 2) Soak the paper in the water. I just put it all in there and start working. 3) Now start wrapping the eggs. 4) Get the whole eggs wrapped. It's okay if you can see the egg color. Once the paper dries you won't be able to. 5). 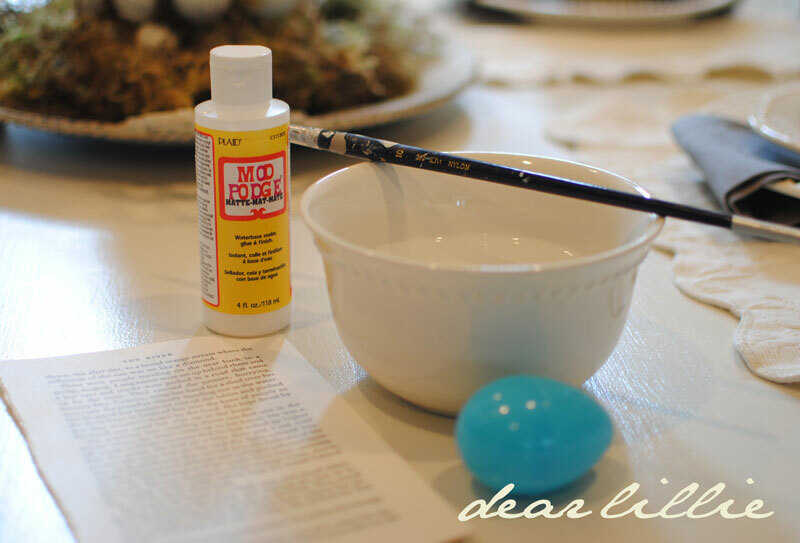 Now just dab some Mod Podge on and brush it over the egg. I dabbed some on each side to get enough to properly cover it. After that I let them dry overnight and then put a dab of hot glue on the top of them and glued some string onto it and then hung them from my branches. I plan on embellishing them at some point here soon but for now they are just plain. Well, the game is about to start so I had better get this posted. As many of your now our lives pretty much revolve around basketball here and of course the Final Four is the most exciting part of basketball season. Jon actually got to play in a Final Four back when he was at Carolina. It is pretty exciting to have a team from our conference, VCU, in it this year and the team they are playing, Butler, has a kid who played for Jon's dad last year so it's a bit hard knowing who to cheer for. This year, we will also be watching the women's Final Four tomorrow night and cheering for the sake of my brother. Yes, you read that right. Haha. It is rather ironic, really. My brother, Jason, is the baby of the family and the only boy (If you have been reading this blog for a while you probably know him from the sarcastic comments he often leaves on my posts). We all grew up playing sports and played basketball very seriously (regular season, summer leagues, AAU, etc.) You would think therefore, that he would have a nice healthy respect for women's sports but instead he has always absolutely loved mocking them. Somehow while at Notre Dame he ended up becoming a practice player for their women's basketball team. If you don't know him that might not seem that funny but if you do you would see just how hilarious a thought that was. So, over the past two years he has had to change his tone from mocking women's sports to having a healthy dose of respect for them. And now, "his" team is headed to the Final Four. 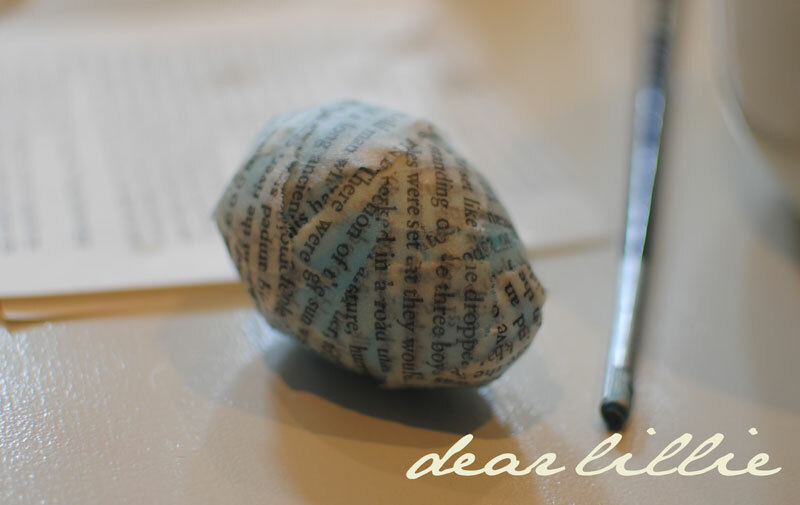 He is a talented writer (he won an huge award his freshman year at Notre Dame for another piece he did) and wrote a pretty entertaining post on his blog that you might want to read. He wanted me to make sure I mentioned he was on a "creative hiatus" until the end of the semester when he graduates and that is why he has a serious lack of posts. He does have some pretty funny ones from last summer though that you might enjoy like this one on Lillie's departure from our month long stay in New Hampshire last summer (please note many of his parenting claims on my part are 100% sarcastic! ), or his take on being a coach at basketball summer camp, or even the Crotty family Olympics (which I sadly missed). If you haven't already entered our baby guessing contest please feel free to scroll down and enter! Especially if you have any name ideas! 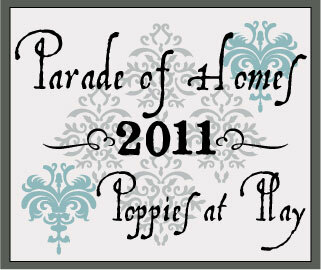 Well, I will be back Monday morning with a post for Poppies at Play Parade of Homes! See you then! P.S. I wrote this earlier and then forgot to his post - whoops! Oh my goodness - how stunning! 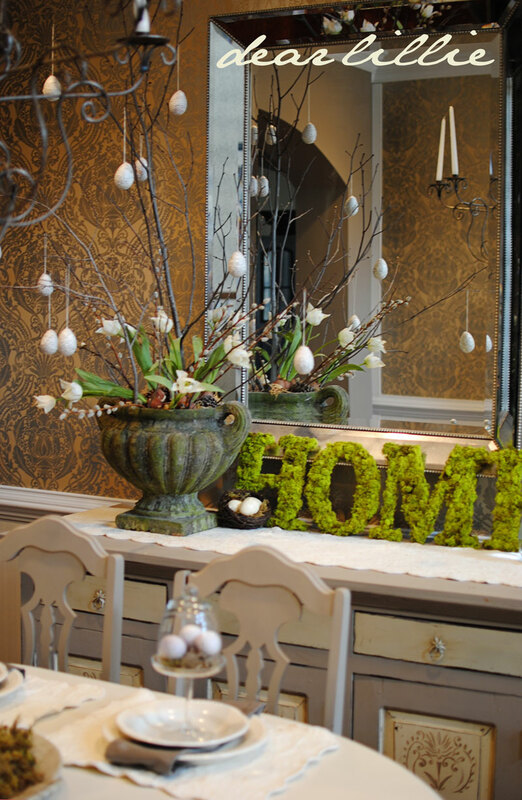 I'm in love with the egg topiary, the moss balls and letters. Forget it, I love it all!! Gorgeous! I love all your happy, Spring-y, Easter-y crafts you've got going here! So cute !! Love all the beautiful photos ! It all looks so pretty! I really like the neutral tones. 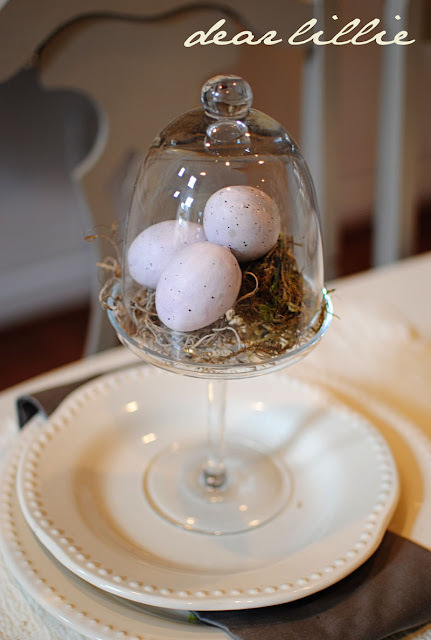 BTW, you have to tell me where you got those adorable mini cloches on your table? I love them! Thanks for sharing! absolutely brilliant decorations. 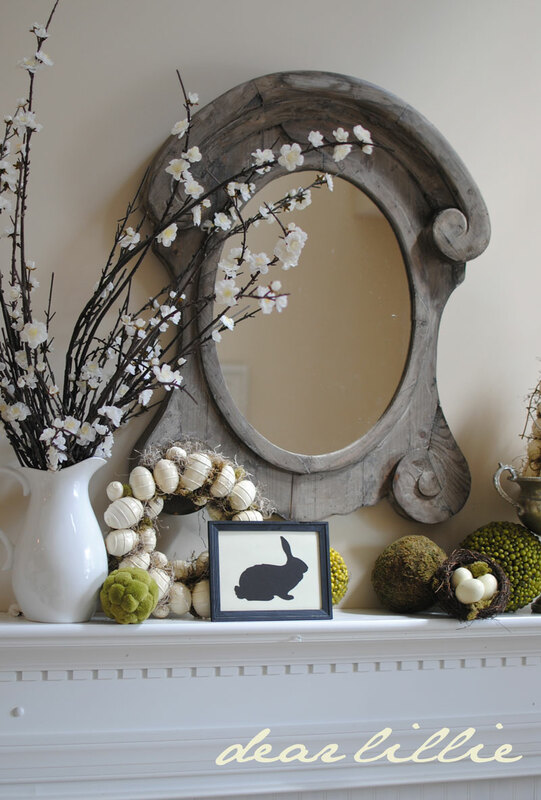 i love them all... did you make the He Is Risen print in the picture frame? i would love to have something like that... so if you didn't make it.. where can i find? :) maybe i need to do a few diy projects here soon! Saw you on Fifi's blog today, yes you deserve the recognition, you are very talented!! 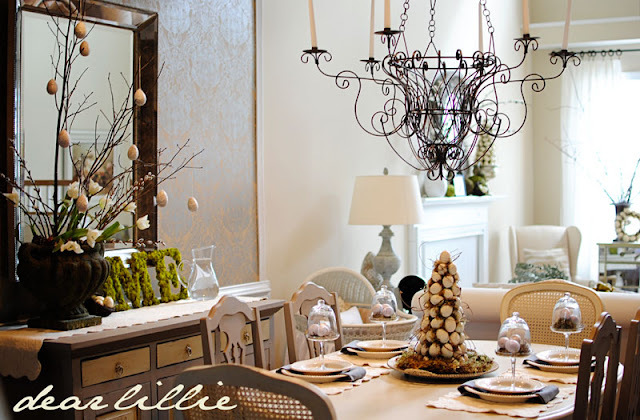 I admire your restraint in decorating and how you do it all while being a mom and wife. Congrats Jen! 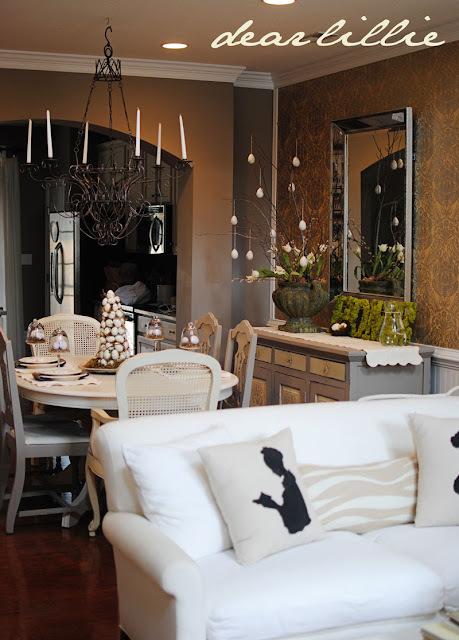 Jennifer, thank you so much for showing all the sides of your gorgeous room. You have such talent. 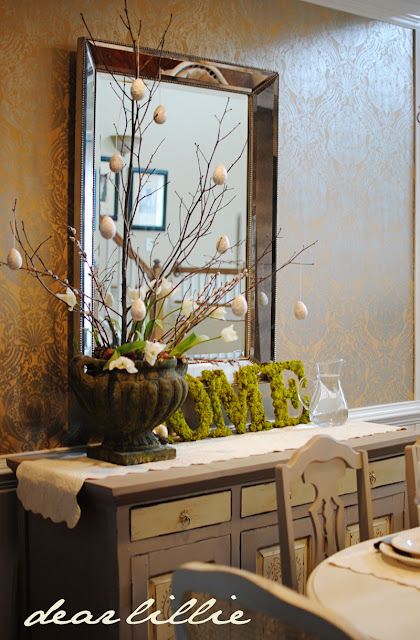 I don't think I ever realized that you have that gorgeous damask wall paper in your dining room. It is absolutely lovely as is everything you touch! Have a great week! Kay - not sure which one you are referring to so I will answer for them both. They are actually both from Restoration Hardware. I got the big one in our dining room at a huge discount. It was the floor model and they will selling it already on sale and it has a little chip in the side so I got it even more discounted. I was so excited because I had been wanting it for forever but it was way out of my price range. I got the one above the mantel for my birthday this year and it also is from Restoration Hardware. Jenna - yes, I did make it. I actually had planned on putting the PDF on here for people to download but I wasn't completely happy with how it turned out. Am going to hopefully play around with it a bit more this week and then will include a free download option in a future post. WOW the room is beautiful!!! I would love to have my living room look like this, but I'm fear my little boys would never keep it clean. I too love the He is Risen print. I have just been talking to my husband about trying to find or make something similar. I hope to see it in a future post. Wow love all the Easter Joy! Your brother sounds like a character! We are just going to bed after watching our hockey team (Canucks) loose! Have a great Final Four & I am off to see Fifis & your bro's blogs! Wow, you have a lovely blog. Hope to see you at My Dream Canvas. 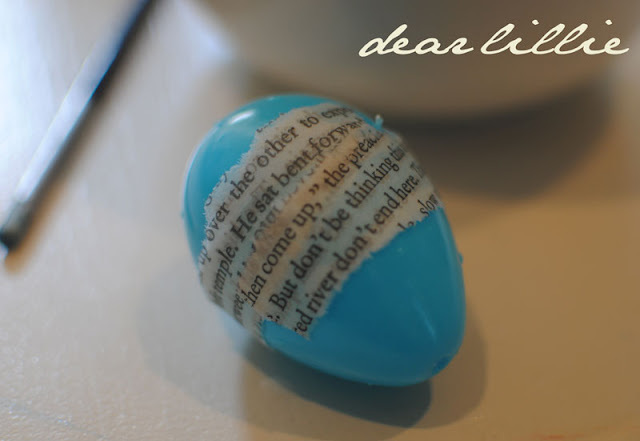 Your Mod Podge Eggs are genious! Thanks for the cheap idea. I love your blog. You are an amazing decorator. I saw your feature today on Fifi's blog. Congratulations! You are most deserving of it. 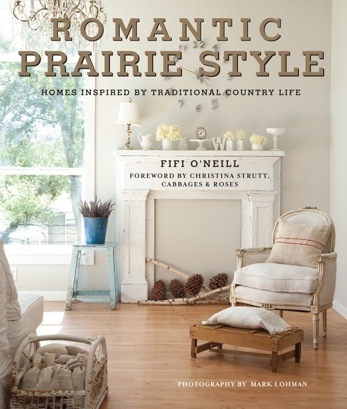 You are so very talented, creative and your home is just stunning. 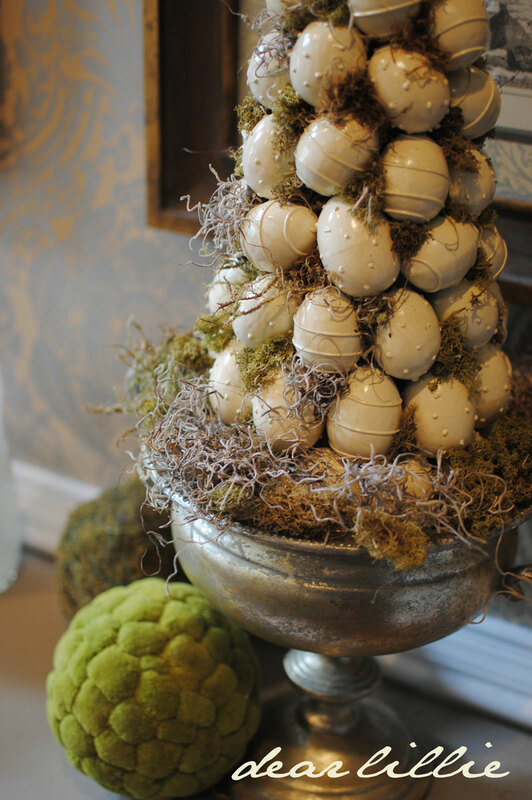 Love the Easter egg tee and your neutral theme. It's very pretty and elegant. You have a good locking home! Lovely decorations. I'm trying, but the all elegant look just doesn't work for me, colors keep sneaking in ;-). I have two more names for you Nicolette ( I prefer the one 'l' spelling) or maybe Rosalyn. Have a wonderful Sunday - maks. Hi, I recently found your blog, and I am in awe of the talent the Lord has given you for decorating your home! Beautiful!!! My life still revolves around the game with my own children now, and there is something special in my heart that only a family member of a coach can truly understand!! Anyways, I could go on and on, but I just wanted to let you know that reading about your lives brought back so much nostalgia, memories, and a joy in my heart of those exciting and fun days of growing up a coach's daughter! Again, your home is lovely and I can see so much love in every beautiful thing you have created! 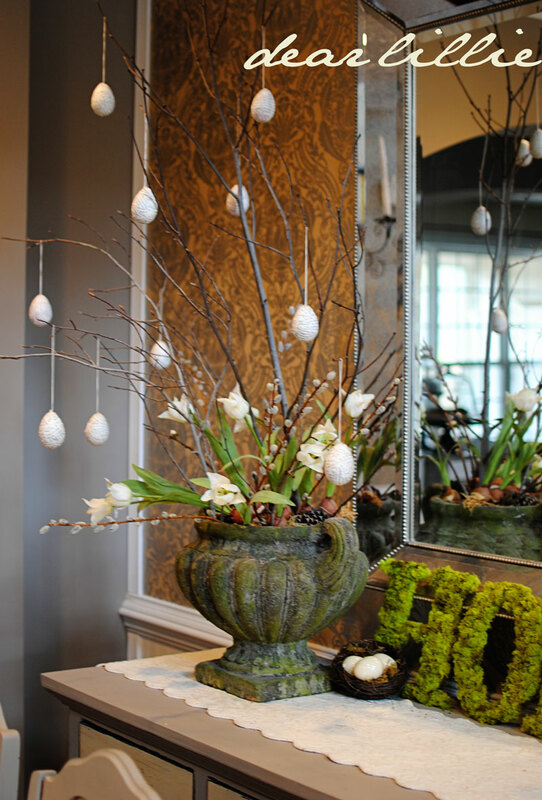 I love all of your spring decor! I couldn't help but notice the "He has Risen". It might be my favorite detail. I also like reading about your family and life--We're huge basketball fans in our house and March Madness is one of our favorite times of year. did you make the He has risen? and if you did will you be doing a tutorial for it? Hi Jennifer, Your egg tree is fabulous as is the rest of the Easter decorations. 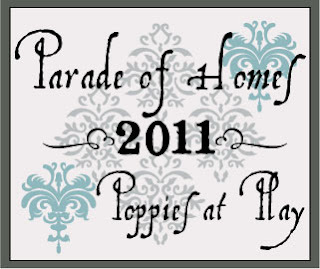 I am looking forward to seeing your gorgeous home at the Parade of Homes. ergh!!!!! has anyone else tried this? the wet paper is not sticking to my plastic egg! i even tried some modpodge on first and still it is not sticking. are my pages too thick I wonder? my hands are sticking together but my paper eggs are not! 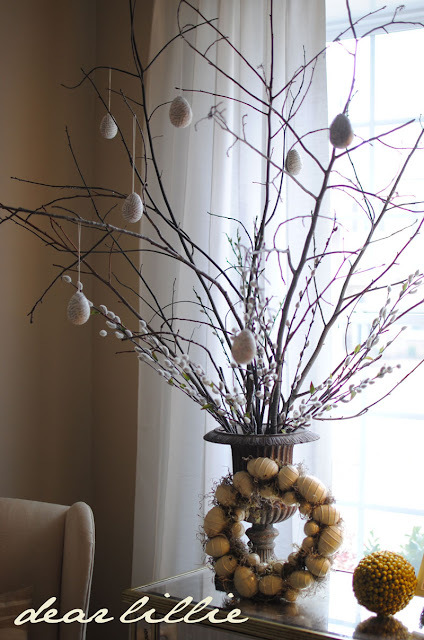 an egg tree is on my easter check list yearly and I still don't have one..thanks for the tips, Ava and I will do try this tomorrow after school! and a big CoNgRaTuLaTiOnS out to you...you deserve every inch of fame. hugs. Anonymous - what a small world! It is so much fun growing up in basketball family, isn't it? Lillie LOVES all of the boys and talks non-stop about them at home and already has a major crush on one of them - uh-oh! Haha! Hayden's Grandma Darcey - It isn't really something I can do a tutorial for but as mentioned I do plan on offering it as a free download once I play around with it some more. Kristincita - hmmmm, that's weird. Mine didn't have any trouble sticking to the eggs. What kind of paper did you use? I just used the pages right out of a book I had that I knew I would never read again. I think newspaper would work even easier. I wouldn't recommend anything thick. 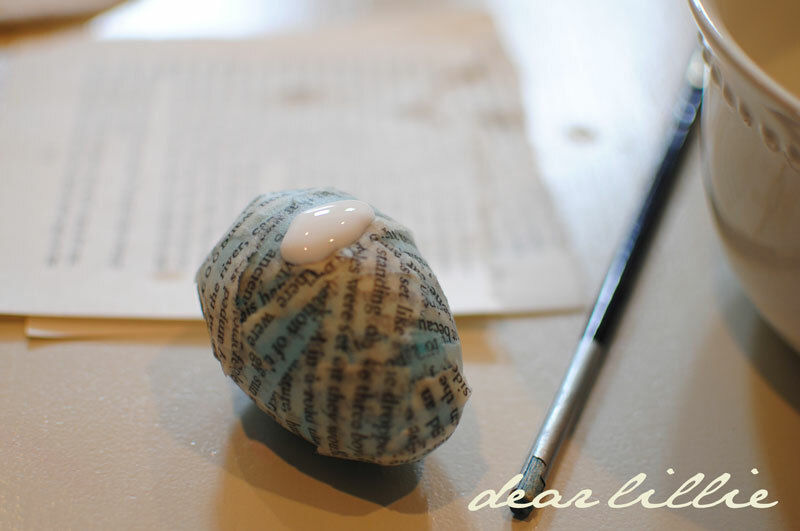 I also didn't use the mod podge until the wet paper was already all over the egg. Not sure what to tell you. Angie - you must have had so much fun watching VCU's run! I know we did! My branches are all from outside. I drag Lillie out whenever I need some new ones for a project and collect a whole bunch and the pick through them once we get them inside to see what works. Unfortunately she manages to think the rest are for her to play with! Oh and Kay, by any chance did you send me an e-mail? I am SLOWLY making my way through e-mails (still have a ways to go) but have several regarding that issue and have been saving those for last as I am still deciding on a few things. Oh my gosh, I so love your beautiful blog. I love everything about it. You are so talented and gifted. Your home is a beautiful mix of old and new. It truly looks like a home! Continued success and good luck with the new wee one! May God continue to bless you! Thanks for sharing. BTW, Lillie is absolutely gorgeous! 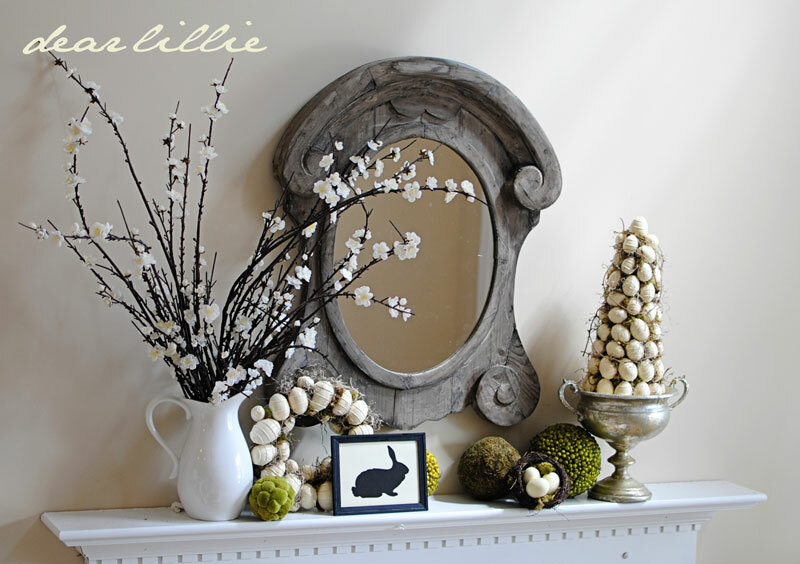 Wonderful images I just adore the creative ideas for displaying the Easter eggs! Beautiful home. Beautiful blog. Beautiful ideas. I just discovered your blog through Jones Design Co. I'm so glad I did! Thank you for sharing a little of your life! Everything is so pretty. I love the eggs you made- thanks for sharing how you do it. Just discovered your blog...and let me tell you I am DROOLING! 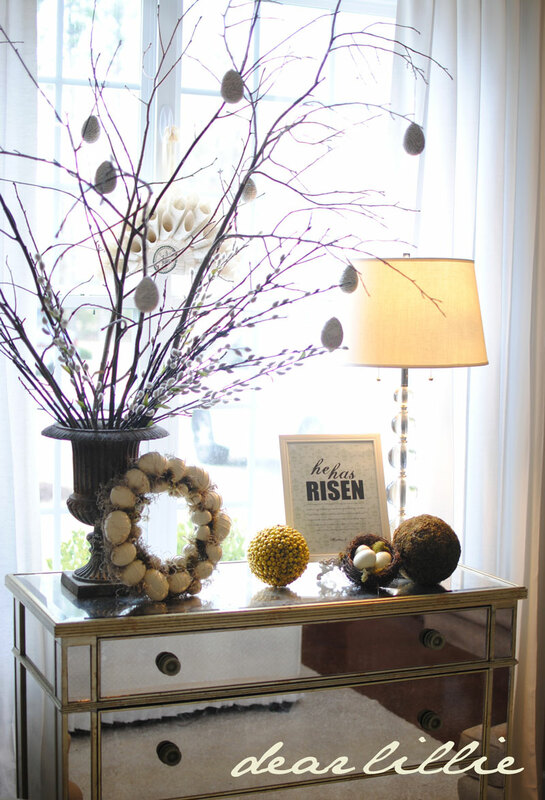 Love what I can see of the "He has Risen" print ~ do you sell those? Thanks for the tutorial, my daughter and I are going to do those today! Gorgeous eggs. 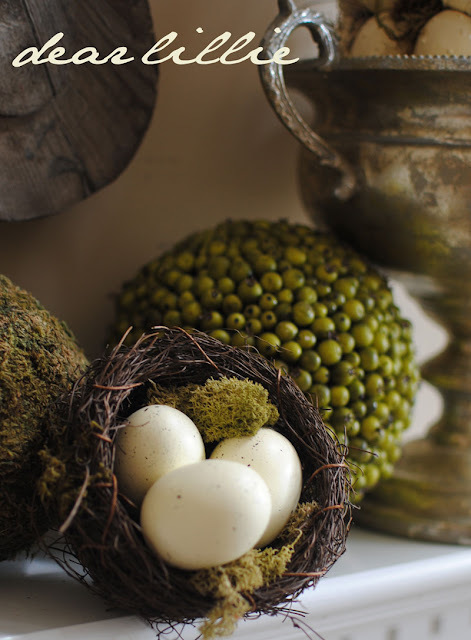 I love the idea of using the old books because it gives Easter a vintage look which I LOVE!! I will definitely use the idea with my nieces next week during Spring Break. Thanks for sharing! Hi Jennifer! I love your Easter decorations...simply wonderful!! I've discovered your blog just recently, but I come to visit it every day! Where did you find the urn you put the branches in with the eggs? I love the wallpaper in dining room. Do you remember what it is called? Can't wait for more seasonal ideas. The urn is from a store called the Horned Puffin in Florence, SC. I have had it for close to five years now. The wallpaper I ordered from American Blinds online and have tried to look up the name of it for several people but can't seem to find it anymore. Not sure if I am just not looking in the right spot or if it has been discontinued. love the newspaper eggs, never would of that at it, nice and modern. i saw some for sale on http://www.homeseasons.com and never thought it would be so simple. thanks for the walk through tips! I know that this was written last year, but I just saw one of your photos on pinterest. 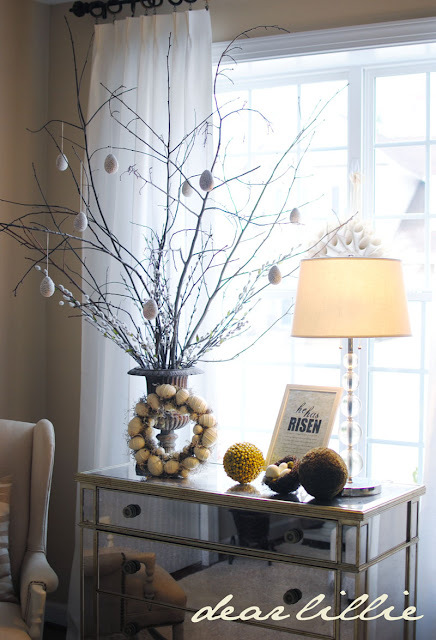 Is there any chance that you can post a close up of your "He is Risen" frame? We're all curious to see what it says! Hi! 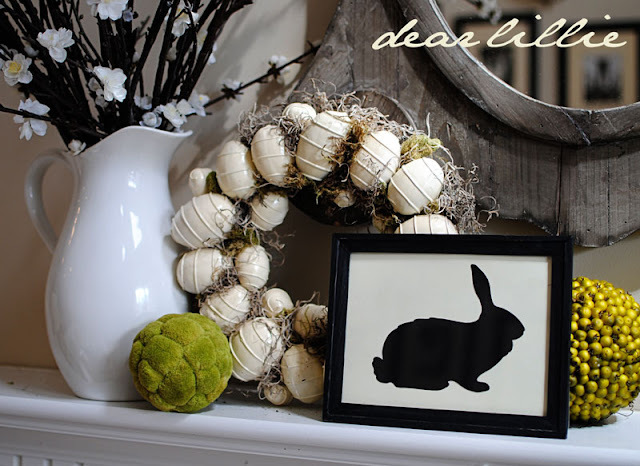 Did you share the download/link for bunny printable?? I love it! No - we just offer the He Has risen as a download. I hope you have a blessed week! Thanks for the tutorial! These turned out great! I know this is old but the Dollar Tree sells bags of Moss for $1! Your Easter decor is SO lovely! I'm featuring your mantel in tomorrow's 5 for Friday on my blog, including one pic and a link back to this post. Keep up the good work - you're rockin' it! This is so beautiful. 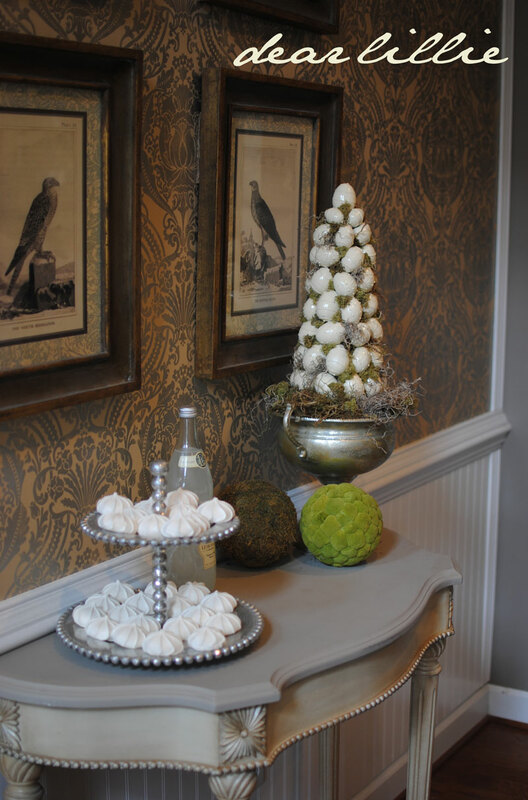 I love everything about it.I featured your decor on my blog today! http://missloviecreations.blogspot.com/2013/03/12-unique-easter-decorating-ideas.html Stop by and grab a button if you like. Have a happy weekend!! 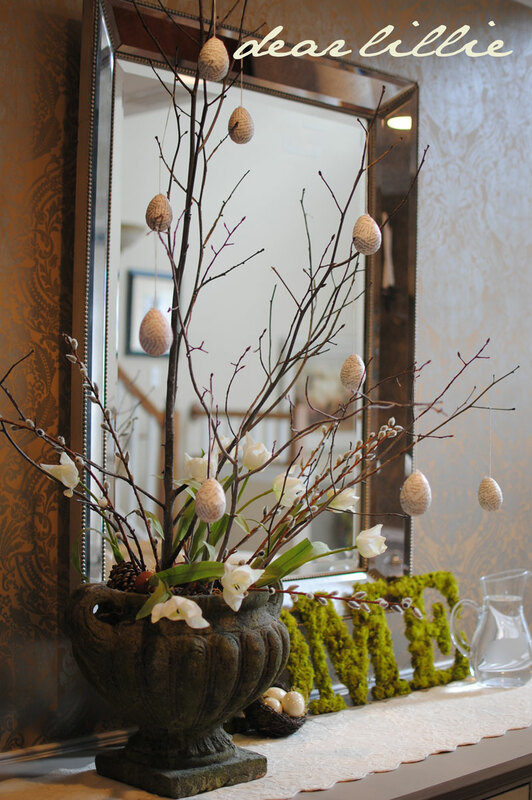 Wow, lovely decorating ideas for Easter. 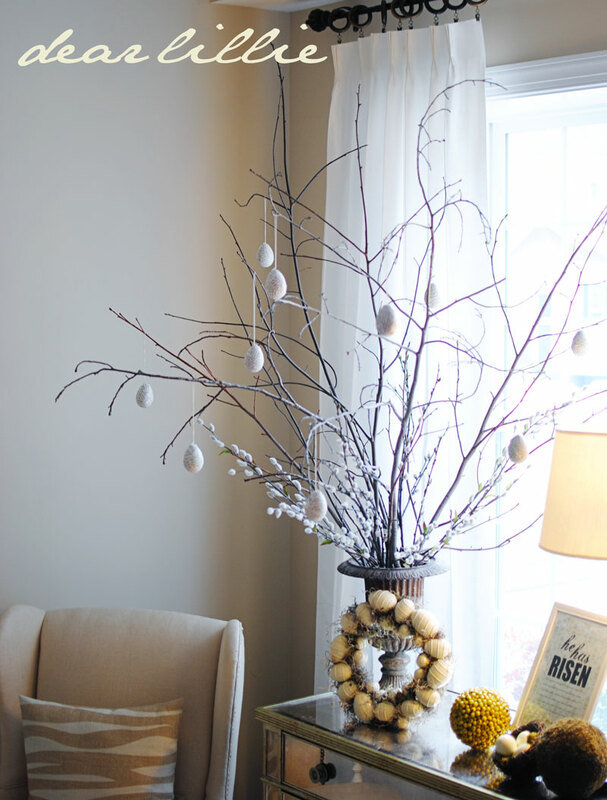 These easter decorating ideas would definitely go to my Easter 2014 pinterest board. Thanks for sharing.